▶︎ FREE DOWNLOAD: https://bit.ly/DownloadRebuildYouSingle ▶︎ Stream on Spotify: https://bit.ly/StreamRebuildYouSingle ▶︎ Watch on YouTube: https://bit.ly/RebuildYouSingleVideo ▶︎ Buy on iTunes: https://bit.ly/BuyRebuildYou To see and hear more from BRVTHR and get the latest updates, please join the Fan List https://bit.ly/FanBRVTHR If you enjoyed “Rebuild You" by BRVTHR, please FOLLOW them on Spotify here: https://bit.ly/FollowBRVTHR and SUBSCRIBE to the BRVTHR YouTube Channel here: https://bit.ly/BRVTHRChannel and SHARE!!! Thank you for listening and PLEASE share your thoughts in the comments below! 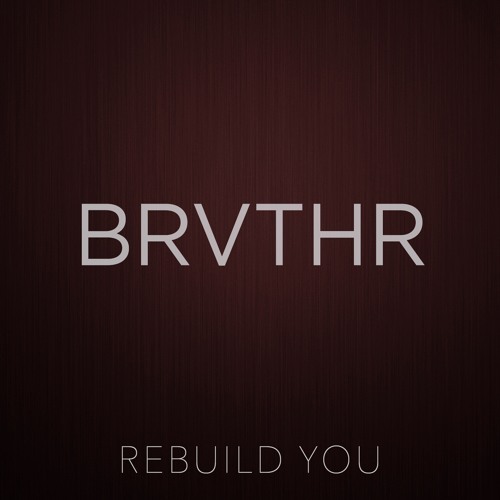 “Rebuild You“ by @BRVTHR Written by Aaron Campbell Produced by Aaron Campbell | Dark Pop Music ℗ & © 2018 Dark Pop Music Tracklist: 1) BRVTHR - Rebuild You Availability: November, 16th 2018 (Lyrics - Rebuild You) I heard that you were feeling down Your tired eyes won’t lift from the ground And all of your sorrow spoke without sound All your thoughts conspire To put your grief to end But sometimes through the trials we must tread Hold steady, friend Time will rebuild you So hold on Hold on, old friend You’re a mannequin, mute Your hands, moving slow But I’ve heard you speak In thunderous tone Your heart’s like a river You’ll soon find your flow All your bones conspire To keep you at unrest But sometimes through the fire we must tread Hold steady, friend Time will rebuild you So hold on Hold on, old friend ✦✦ BRVTHR ✦✦ Soundcloud: @BRVTHR Spotify: https://bit.ly/FollowBRVTHR Facebook: https://bit.ly/LikeBRVTHR YouTube: https://bit.ly/BRVTHRChannel Twitter: https://bit.ly/TweetBRVTHR Instagram: https://bit.ly/InstaBRVTHR ✦✦ Dark Pop Music Group ✦✦ Soundcloud: @DarkPopMusicGroup Spotify: https://bit.ly/FollowDarkPopMusicGroup Facebook: https://bit.ly/LikeDarkPopMusicGroup YouTube: https://bit.ly/DarkPopMusicGroupChannel Twitter: https://bit.ly/TweetDarkPopMusicGroup Instagram: https://bit.ly/InstaDarkPopMusicGroup Website: https://bit.ly/DarkPopMusicGroup (About) BRVTHR is a songwriting and production duo poised to highlight the product of creativity rather than the identity of creators. Their writing style is heavily rooted in pop sensibilities and riddled with experimental subtleties, and dark undertones, creating songs under the veil of obscurity that is "Dark Pop Music." (Contact) brvthr@darkpopmusic.com © 2018 Dark Pop Music. @xxxhiphoprap-repost: Thank you so much for your support! Appreciate it! @user-928181920-26677006: Glad to hear you are a fan! Thanks for the love! @the100repost: Thank you for your support! Cheers!